I happened to tune into the 2002 movie Enough on TNT last night. There is info on Wikipedia and IMDB. It stars Jennifer Lopez ("J-Lo") who was a huge star at the time. She was in a rage about her husband's infidelity, got into a fight, and kidnapped their daughter. After being advised of the illegality of kidnapping, she gave the kid to a friend to hide in another state. That was all in about 10 minutes, and I could not bear to watch anymore. According to the plot summary, the husband went looking for him while she trained to kill him. At the end of the movie, he finds them, she murders him, and runs off with her daughter and an old lover. The movie was a box office flop. 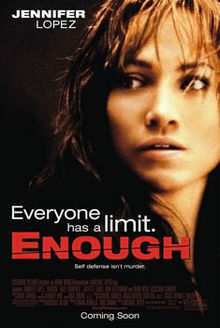 As you can see from the movie poster, J-Lo is presented as some sort of hero for this. Admittedly, I did not watch this movie, but it seems to me that no matter how much J-Lo's husband was a jerk to her, he still has a right to see their daughter. J-Lo makes no attempt to find a lawful and peaceful settlement. The movie poster says "Self defense isn't murder", but that is not plausible when she is spending many months planning to kill him while he is merely insisting on his right to see his daughter. The soundtrack has a song titled "Setting the Trap", which I guess is her plan to trap and kill her husband. I am hoping that this movie was a flop because most people were disgusted by it. wonder if that woman in NYC just acquited of cold blooded murder, er, self-defense watched that movie for inspiration. Guess her husband had fresh blades in his razor and that set her off. Look at the media bias vs. men. It's "deadbeat dads, not "deadbeat non custodial parents" right ? and "mothers against drunk drivers" not "parents against drunk drivers". I find it very strange that the word "abuse" doesn't appear in your posting. It does appear as the second word in IMDb's Storyline for the movie: "An abused woman..." I have to wonder whether you are capable of recognizing abuse when you see it since you go out of your way to avoid use of the word. As far as I know, there is no abuse except for one isolate fight after J-Lo threatens to leave the marriage and take their kid, and her husband's attempts to find their kid according to lawful court orders. One isolated fight is not abuse, in my opinion. Abuse is an ongoing pattern of serious maltreatment of some sort. Instead of "an abused woman", maybe the tagline should have been "a wife who picked a fight after discovering her husband's infidelity". Correct me if I am wrong, as I only saw a small part of the movie. An older Wikipedia page has a more detailed plot summary. While I agree with you that this woman may have had other options to consider, had you watched the whole movie you would have gotten a better picture of the abuse. He initiated several physical altercations. In the second, he pulled her around by the hair while she held their child, before punching her in the face and kicking her repeatedly in the stomach and ribs. Once when he tracked her down while she was in hiding, he knocked over his little girl when she came to her mother's defense as he was choking her. He also repeatedly and graphically threatened to kill his wife and anyone who tried to help her. So the full picture is not that he's this dedicated dad who had a one-time slip up and smacked his wife during a heated argument.